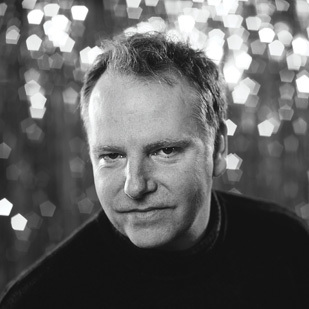 For as long as he can remember, Guy Maddin wanted to make movies that look like movies from 80 years ago. He’s a lifelong inhabitant of Winnipeg, an ice-encrusted, gloriously decrepit city on the terrifyingly vast Canadian prairie — an area that just happens to be the nation’s secret cultural wellspring. As evidenced in his comparatively luxuriously budgeted The Saddest Music in the World (2003), which starred Isabella Rossellini as an amputee beer baroness, Maddin favors primitivism, melodrama and the haunting artifice of early cinema, while complicating cosy nostalgia with frenzied editing, anachronisms and bizarre, highly neurotic subject matter. His personal life is often an inspiration, but distorted and absurdly mythologized through the morbid imaginations of Maddin himself and longtime writing partner George Toles. Maddin’s silent feature Brand Upon the Brain! had its premiere at the 2006 Toronto International Film Festival with full orchestra, live Foley artists and live narration. Like Cowards Bend the Knee (2003) — a love triangle involving abortion and obsession, hockey and hand transplants — it features a protagonist named Guy Maddin and is riddled with guilt, fearful slips into shadowy memories and unresolved confusion over desire and identity, all played out on an island of orphans driven to emancipation by a hot teenage detective. The morning after the film’s triumphant debut, Maddin’s obvious glee was pushed to greater heights when he sweet-talked the armed officer rather ominously monitoring our talk into letting us fondle his machine gun and examine his hollow-tipped bullets. Stop Smiling: An unusual and complicated strain of autobiography runs through your work. Why so many characters named Guy? Guy Maddin: If you’re being as transparently dishonest as most filmmakers — you know, Martin Scorsese having a taller alter ego in Robert De Niro — you might as well just come out and say who it is. Besides, you have to be pretty sure that your alter ego, if he isn’t named after you, is doing pretty interesting, compelling things, whereas I feel like you’re buying a little extra goodwill from the audience by naming the character after yourself. It’s tricky, of course. You’re all of a sudden engaging yourself in an act of masochism if you’re making yourself look bad. You’re really indulging yourself in self-pity if you’re depicting your horrible childhood, and that can only be withstood by an audience for a few minutes before they hurl. So it’s strangely liberating just being up-front about it, saying, “This is me,” because every character in the movie is me anyway. All I can go by is what I myself would do in a certain situation. SS: You’ve said somewhere that the “Guy Maddin” in Cowards Bend the Knee was actually less representative of you than another character in the film. GM: Yeah, it was the girl that Guy went out with, this character named Meta. At some point I realized that I was just as much her as I was myself. Not that I’m a girl. But a lot of her petulance and stubbornness and hysteria seemed to resonate. I remember Ingmar Bergman saying that in a film like Persona both of the women would be him, but two different aspects of him — that it’s pure autobiography up there, not on a point-by-point basis, but as spiritual autobiography or whatever. That lit the way for me and was something I remembered for a long time: that different characters could simultaneously represent you, just not on a surface level. It’s not whether your dad was really exhumed that matters, but the feelings that exhumation would produce in you, if you’re being honest about things and putting them up on the screen. By breaking yourself up and spreading yourself around a bit, you can indirectly get at something you really felt. SS: Do your dreams resemble film? GM: No, almost never. Every now and then I have a dream that I’m watching one of my own movies, and it becomes much better than it really is, and I realize that I should have been a little more daring, or a little more ambitious. There’ll be long tracking shots and I have no idea where they’re going to go. It’ll be really intriguing and the curiosity mounts, and then there’s a great payoff. Rarely when you wake up can you write it down and then act on it, of course. But these dreams remind me to try harder, work harder. I have this longstanding battle with my ambition. Sometimes I get really lazy. It usually helps to have a filmmaking rival that you can compete with. SS: But you don’t really have one, do you? GM: No, I don’t really. I used to try to make Atom Egoyan into a rival, but he’s too nice and makes completely different kinds of films.